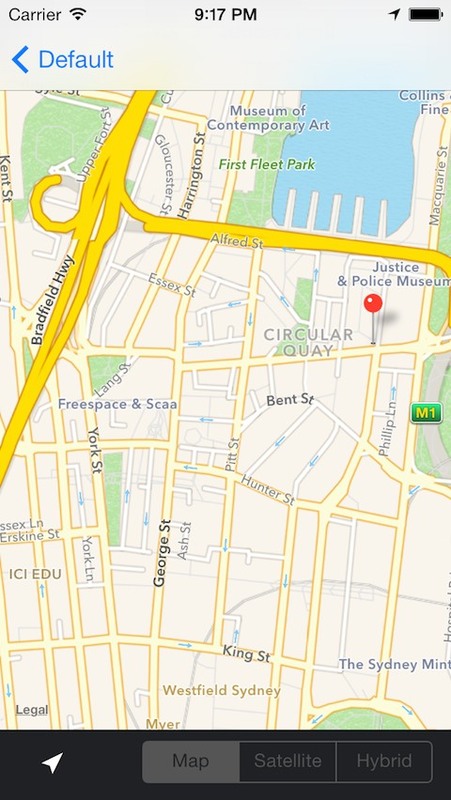 Important Note 1: For location based triggers to work correctly (i.e. both WiFi AND GPS based triggers), WiFi MUST be ON at all time. Turning WiFi OFF at any point in time will render location based triggers inaccurate and/or inoperative. Important Note 2: Users who have previously used SBProfiles on iOS versions prior to iOS 7, please note that as of iOS 7, SBProfiles no longer supports SBSettings toggles. It uses Flipswitch toggles. Upon upgrading to new versions of SBProfiles, those users will have to reconfigure all their profiles to use the relevant Flipswitches as all previous SBSettings toggles will be marked "". If you have not upgraded to iOS 7+ however, SBProfiles will continue to use SBSettings toggle and no changes to your profiles are required. Existing registered members must re-register their product key when re-installing SBProfiles on iOS 7 for all advanced triggers to work. (Yes, even if SBProfiles says "Registered" already). 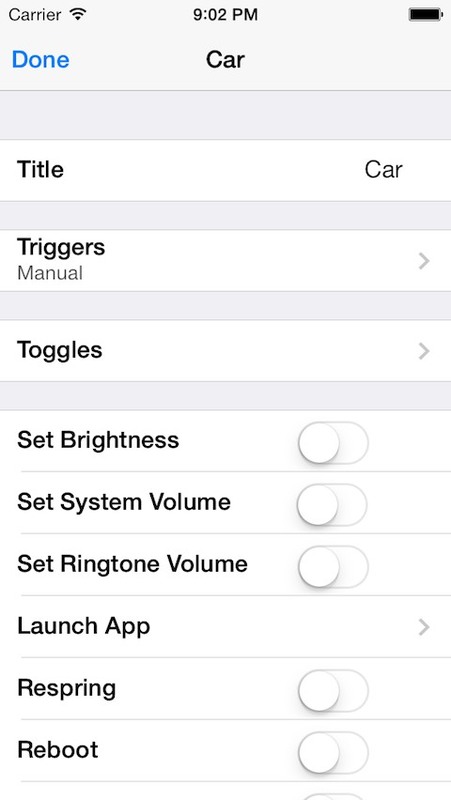 SBProfiles allows you to combine your SBSettings toggles into profiles that can be triggered at a given time or manually applied via a Quick Access Menu from any app or even from your Lock Screen. Registered users can also trigger profiles automatically based on which WiFi network or Bluetooth device they're connecting to or disconnecting from. (i.e. you may want to activate one profile when moving within range of your Home WiFi, another one triggered when within your Work WiFi range and a third one when moving out of WiFi range). Profiles can also be triggered based on your GPS location (requires WiFi for more accurate positioning), the state of your battery charger and/or your lock screen. Each profiles can be configured to switch a series of toggles on or off in the order that you specify. This allows you to fine tune all your settings exactly the way you want them to be depending on your location or time of day. For example, when you're home you might want to turn WiFi and Ringer on, but turn Vibrate, Bluetooth and Cellular Data off. But when you're at work, you might want WiFi and Vibrate on but Ringer off. And when you're asleep, you might want Airplane on and leave everything else untouched. As well as switching toggles on or off, each profile allows you to set your display's brightness level, your system volume, or your ringtone volume. 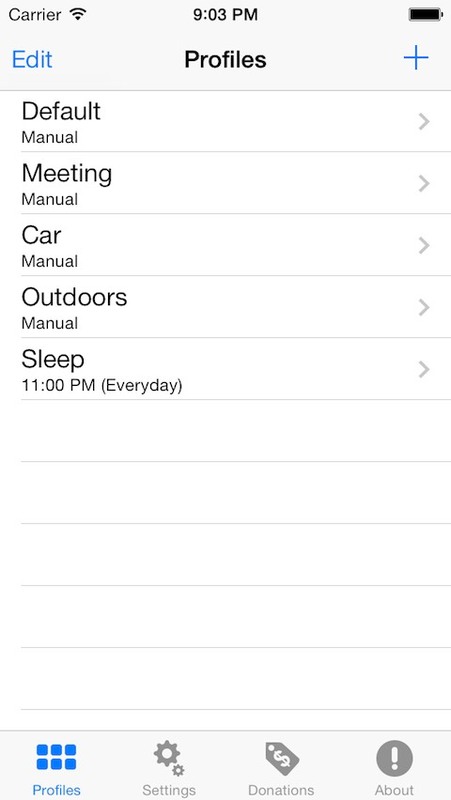 You can also program your device to respring, reboot or shutdown at a given time and on certain days of the week. 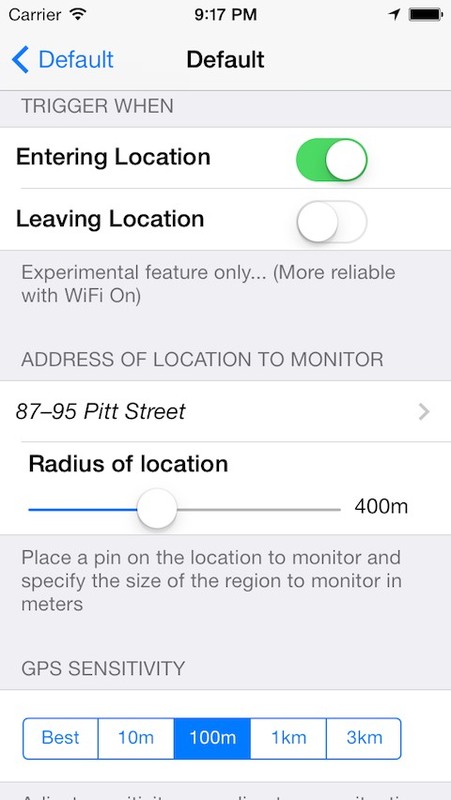 SBProfiles works on iPhones, iPads, iPods and is compatible with iOS 5.x, 6.x, 7.x., 9.x (WiFi-based and GPS triggering is only possible if WiFi is set to "ON" in your Settings app). I rely on your donations to maintain and improve this app. So if you like it, please donate.